kc bob: Anyone surprised that this biker was stereotyped? "To the family in the red SUV at Tim Horton’s today. Yes I am a big 280 lbs guy with motorcycles and a full of tattoos, I am a welder, I am loud, I drink beer, I swear and I look like I would eat your soul if you stare at me wrong. 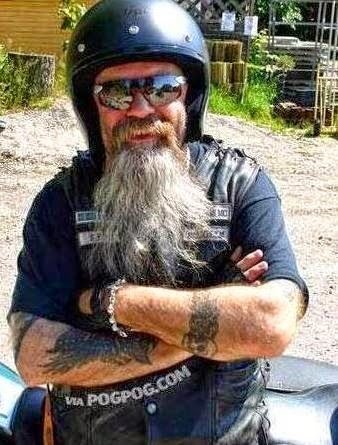 So next time I smile and say hi to your little girl and you grab her and tell her “No no dear we don’t talk to dirty bikers” remember that even tho you hurt my feelings this “dirty biker” would be the first person to run into your burning house to save your little girls gold fish so she wouldn’t be sad!!!!" This story is going viral on FB. Reminds me about how we still stereotype people who do not look like us. Here are some friends of ours you may enjoy getting to know. Believe it or not, Jack and I once rode Harley s and even though we can no longer ride, we still love motorcycles. "Man looks on the outward appearance; God looks on the heart." How much do we miss by making judgments based on the superficial? Love that 1 Samuel verse vanilla!